‘There is no limit to what we, as women, can accomplish’. Congratulations to all Plashet students on their outstanding results. We are delighted that 40% of all GCSE grades have been awarded 9, 8, 7, A* or A – the top grades. Plashet’s academic strength is especially impressive, with 105 students achieving at least one grade 9 or A*. After weeks of waiting for their examination results, the School is proud and pleased that all of the students’ hard work over the last five years has been recognised. 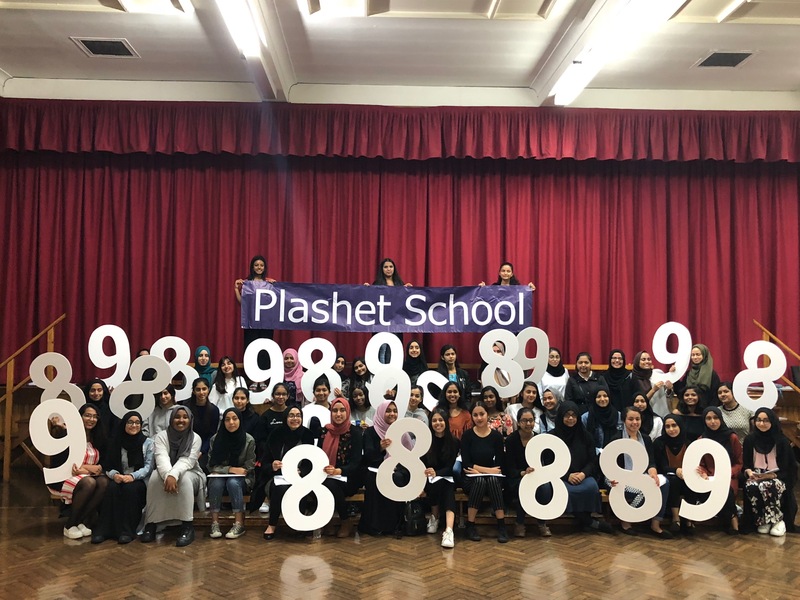 In a climate when young women pursuing STEM subjects is very low nationally, Plashet is very proud that 1 in 4 of this year’s leavers achieved grades 7, 8 or 9 in 2 or more Science courses and 1 in 3 gained grades 7, 8 or 9 in Maths. A large number will go on to study maths and the sciences at A Level. We must not forget, however, that top grades are not the be all and end all, and the School is equally proud of those girls who may not have achieved all higher grades but have surpassed their own expectations to achieve strong results – Plashet’s holistic vision of education means that we value highly those who, alongside their academic achievements, demonstrate that they are talented actors, chefs, sportswomen, musicians and artists. Head Teacher, Rachel McGowan, said: ‘Our girls’ GCSE successes are outstanding, they have worked particularly hard in meeting the challenges of the new more rigorous GCSE examinations and this is even more pleasing because their academic work is just one of the many things they do at Plashet. There are 268 individual stories but two that I would highlight are Noor Talib who fought cancer throughout Years 10 and 11 and still sat and gained strong passes in all 6 subjects she took and Maimoona Khan who achieved grade 9s in all eight of her subjects, in what is the toughest examination year ever for GCSE students ever. In their time with us, this year’s cohort have grown into confident and socially aware young women. It has been a privilege for us to both teach them and learn from them and they will all, I have no doubt, excel on their journey beyond Plashet. We wish them the very best for the next phase of their journey. All of examination results remain provisional and subject to change until after the enquiries about results process is completed.